The lives of Hazel and Howard Kauf, in many ways, resembled the lives of couples across Montana and the United States during World War II. Philipsburg native Hazel Alda Henri married Howard Kauf, a local manganese miner, in 1936. Howard spent the early war years laboring in a strategic industry, mining. In 1945, however, he enlisted in the U.S. Navy, joining fifty-seven thousand other Montanans in the armed services. Shortly after Howard’s deployment, Hazel and the couple’s four-year-old son moved to Butte, where Hazel, like over a million other military wives nationwide, entered the workforce. For many women, World War II offered emancipation on an unparalleled scale, as they gained greater access to education, employment, and economic independence. Hazel, too, seems to have been fulfilled by the opportunities she found in Butte. Working as a waitress and in a Park Street store, she formed a close group of female friends with whom she participated in the city’s entertainment. Howard recalled that Hazel aspired to open a dress shop. 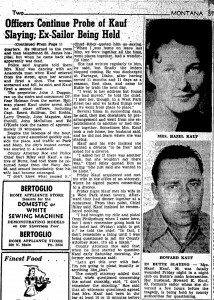 When she asked for a divorce, the rates of which peaked immediately following the war, he reported that “She just said she wanted to be alone,” she wanted “to be free.” Hazel momentarily secured her freedom when the Kaufs’ divorce was finalized on February 8, 1946, hours before her murder. Similar to her life, Hazel’s death—and the manner in which it was interpreted—reflected the experiences of thousands of women. At the coroner’s inquest, a Mr. Sullivan, counsel for the defendant, attempted to justify Howard’s actions by focusing on Hazel’s behavior, particularly her “failure” to conform to feminine and wifely standards. Sullivan inquired about Hazel’s drinking habits, the “places of amusement” and parties she attended, and he drew attention to the fact that she and her female friends often attended these events without their husbands—all while Howard was serving his country. Similarly, he cast aspersions on Hazel’s female friends who had witnessed her murder. To undermine their testimony and Hazel’s character by association, Sullivan asked each of them about their marital status and their drinking habits. He also pointed out that, on the night of Hazel’s death, none of them had objected when several men asked them to dance without first securing proper introductions. The narrative that women were potentially at fault for their own victimization was also present in State of Montana v. Howard Kauf. Jury instruction 45 ordered the jury to consider Howard’s sanity at the time on the basis of “his temper, jealousy, shattered hopes, desires, and troubles of all kinds,” insinuating that Hazel may have actually driven Howard to murder and that violence was an understandable reaction to her wifely shortcomings. The coroner’s jury deliberated for five hours before determining that Howard was at fault for Hazel’s death and that the crime should go to trial. The first trial jury reached a stalemate. The second sentenced Howard to the minimum sentence of ten years. While Howard was found guilty, the scrutiny of Hazel’s behavior throughout the inquest and trial demonstrates the pervasive belief that women, if they “misbehaved,” might give their husbands just cause to respond violently. Despite ongoing bias in the courts, women did not passively accept the patriarchal worldview that undermined their ability to escape violent relationships. Nor were they ever merely victims. On the contrary, they, like Hazel, were friends, sisters, mothers, and integral parts of their community. They were women who participated in activism, resisting legal and cultural biases by filing assault charges against violent husbands, acting as legal guardians for women under eighteen years of age so that they could secure divorces from violent husbands, and, as evidenced above, testifying on one another’s behalf. These individual acts of activism became organized in Butte in the 1970s when women set up a network of “safe houses,” worked to educate the public about domestic violence, and established a Woman’s Referral Center at the local YMCA. After years of work by individuals and organizations alike, the State of Montana formally adopted a law explicitly addressing intimate partner violence in 1985. For more on women’s struggles in court, see “A Man in the Mountains Cannot Keep His Wife”: Divorce in Montana in the Late Nineteenth Century or “We Are No Longer Criminals”” The Fight to Repeal Deviate Sexual Misconduct Laws. Del Mar, David Peterson. What Trouble I Have Seen: A History of Violence against Wives. Cambridge: Harvard University Press, 1996. ___________, and Ellen Crain, eds. Motherlode: Legacies of Women’s Lives and Labors in Butte, Montana. Livingston: Clark City Press, 2005. Gordon, Linda. Heroes of Their Own Lives: The Politics and History of Family Violence, Boston, 1880-1960. New York: Viking Penguin, 1988. 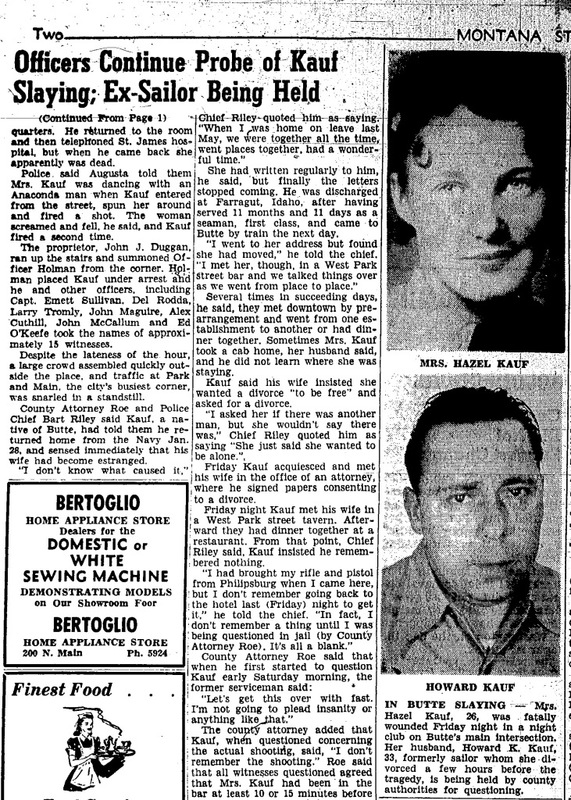 “Officials Probing Details of Hazel Kauf Death: Ex-Navy Man Being Held in Jail; Inquest Scheduled,” Montana Standard, February 10, 1946. Pleck, Elizabeth. Domestic Tyranny: The Making of American Social Policy against Family Violence from Colonial Times to the Present. New York: Oxford University Press, 1987. State of Montana v. Howard H. Kauf, March 1, 1947, District Court Second Judicial District, County of Silver Bow, register/case no. 7873, Silver Bow County District Courthouse..
Tuttle, Daddy’s Gone to War: The Second World War in the Lives of America’s Children. New York: Oxford University Press, 1993.